I don’t know if you’ve heard, but there’s this guy running around claiming to be Chinese, and he happens to write poetry, and, right, he’s not Chinese. Also, it worked. 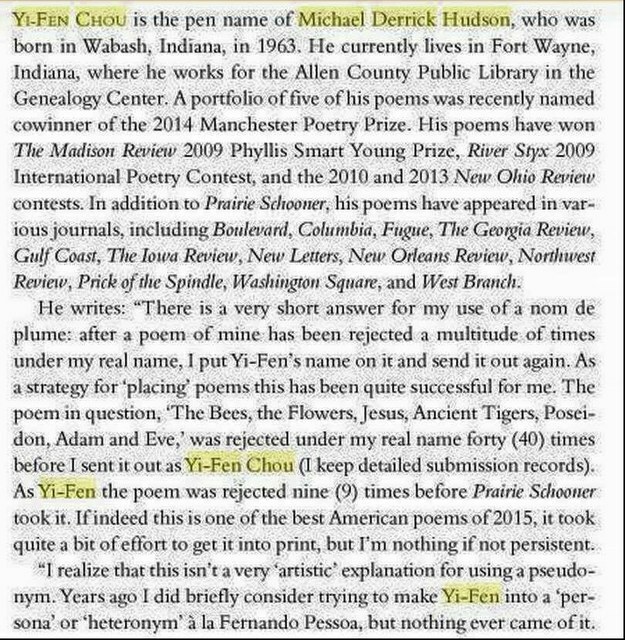 This guy, Michael Derrick Hudson, writing under the pseudonym Yi-Fen Chou, now has himself a Best American Poetry badge. He’s an imposter, a charlatan, appropriating ethnicity as a tactic for getting an accolade, or maybe as an activist performance to highlight the injustices of reverse racism. A lot of people have been talking about it, passionately, personally, with anger and frustration, laying out an arsenal of theories and logics to establish or reinforce what we might call the proper ethics of artistic identity, of identity politics and the right to voice. At this late hour in the news cycle of the Yi-Fen Chou debacle there has been enough conversation to offer a fairly coherent set of coordinates that map the proprieties of ethnic and racial identity in contemporary American poetry, in the immediate, and in American culture more broadly construed. If you want the news, you can read what Jennifer Schuessler has to report at the New York Times. If you want to hear it straight from the editor—Sherman Alexie—who has been wringing his hands over the affair, you can read his extraordinarily thoughtful response at the BAP blog. If you want a roundup of the conversation, the Poetry Foundation has it for you. What follows here is a rough and succinct guide to the central issues that constitute this story, the ways we think about who we are and whether we can pretend to be someone else. A nota bene—you will no doubt notice my name as an Asian one. I have many personal feelings on this matter, but for the most part my aim is simply to break down the dialogue into the most meaningful and illuminating categories that I can. So let’s get on with it. . . .